As a child, I remember marveling at the quart jar full of old buttons at my grandmother’s house; I would pour them out onto the floor and separate out the ones that I thought were the prettiest. 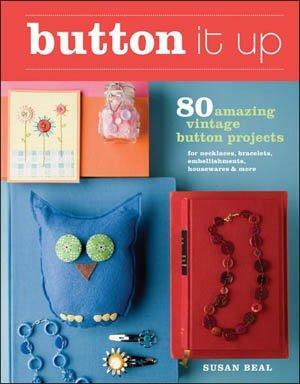 Twenty some years later, and I find myself wishing for that quart jar as I read Button It Up: 80 Amazing Vintage Button Projects for Necklaces, Bracelets, Embellishments, Housewares & More by Susan Beal. The book is divided into sections by project type: two on jewelry (my favorites: the button link necklace and button cuffs), one on housewares (I’m planning on making the dinner party set for a present) and one on accessories, embellishments and gifts (the button stationery is super cute). Though it isn’t just a how-to book; the first chapter is an interesting one on the history of buttons. Yes, I realize that it may sound unexciting, but I hadn’t before realized how much the style and design of buttons changed with the times: from the black jet beads popularized by Queen Victoria’s mourning dresses to the historical souvenir buttons of World’s Fairs and movies in the middle of the 20th century. As a teacher of technical writing (not as boring as it sounds), I was impressed by the readability and clarity of the directions on the projects. The steps are written specifically. Unlike some craft books, this one has an image for every project on facing page. There is no searching for what the project should look like. One downside is that many of the projects displayed have buttons that seem hard to get, so it may not be possible to replicate the design exactly. On second thought, perhaps that’s a good thing. No matter how many people have the book and make the same pattern, you’ll still come out with an original, one of a kind item. You don’t have to have a stock of buttons or craft materials on hand before you start; there is a clear list of materials needed for each project as well as instructions on techniques at the beginning of the book. A resources section includes information on some of the best places to get buttons. While most of the brick-and-mortar stores are in New York City or California, there are plenty of online options available. It is a book written for a more “traditional” woman; the assumption is that button necklaces and button embellished bags would be of interest. Some items seem more geared for an older generation (I’m in my twenties), but there really seems to be something for everyone. I especially liked the button toys section; I’ll be making the felted owl with button eyes and toes for my niece.